If tooth loss was a result of periodontal (gum) disease, or if the bone and gum tissues that surround nearby teeth are not healthy, this can make it more complicated. Periodontal health (“peri” – around; “odont” – tooth) is crucial to the success of orthodontic treatment because the tissues that surround the teeth (bone and gums) have to rebuild themselves as the teeth are moving; they can do this easily if they are healthy, but if any periodontal inflammation is present, bone loss can occur. Teeth can move because of the way they are attached to the bone that surrounds them. Contrary to what may seem to be the case, teeth are not set in the bone like pillars in concrete. In fact, they are held in their sockets by a network of collagen (protein) fibers forming what is known as the periodontal ligament. It is elastic, and therefore allows micro-movement of the teeth all the time — when biting, for example. Since the periodontal ligament and the surrounding bone are living tissues, they are constantly changing and remodeling themselves in response to various forces or stimulation. A force that pulls or stretches is called “tension;” one that pushes or compresses is called “pressure.” When a light and controlled force from an orthodontic appliance is placed on the tooth’s tension side, new bone, ligament and cementum (outer tooth-root material) are formed. On the pressure side, cells will remove bone and ligament to allow the tooth to move. It is analogous to moving a stick through sand: The sand will clear away in front of the stick and fill in behind it. Studies have shown increased biofilm (dental plaque) accumulation and gum-tissue inflammation during treatment with traditional fixed appliances. The problem is that orthodontic treatment with traditional metal braces often makes periodontal health harder to maintain. Studies have shown increased biofilm (dental plaque) accumulation and gum-tissue inflammation during treatment with traditional fixed appliances. Biofilm accumulates more quickly around orthodontic hardware in the absence of effective oral hygiene, and it is more difficult to clean teeth effectively with braces. Gum recession and mild bone loss may occur in some adolescents — even though members of this age group generally have healthier periodontal tissues than adults. Moving teeth in the presence of periodontal disease more often seen in adults, can worsen the condition and even accelerate the loss of tooth-supporting bone. Another plaque-related problem commonly encountered in orthodontic treatment with fixed appliances (braces) is decalcification. This is a process by which the tooth enamel around or under the brackets starts to be dissolved by acids in biofilm that isn’t removed promptly. This doesn’t mean one shouldn’t wear metal braces — it just means that keeping teeth plaque-free with fixed orthodontic hardware is more challenging. This person needs orthodontic treatment to create not only the ideal amount of space for a permanent replacement tooth but to correct other tooth position issues; however, she does not want this gap to be visible during her treatment. While she is undergoing orthodontic treatment, a temporary replacement tooth is built into her clear aligner so that her smile will look as good as possible during treatment. This is not really an issue, however, with clear aligners. Moving teeth this way offers specific advantages to adults, especially when periodontal health may be compromised. The biggest is that oral hygiene is much easier: the aligners can be removed for flossing and brushing. 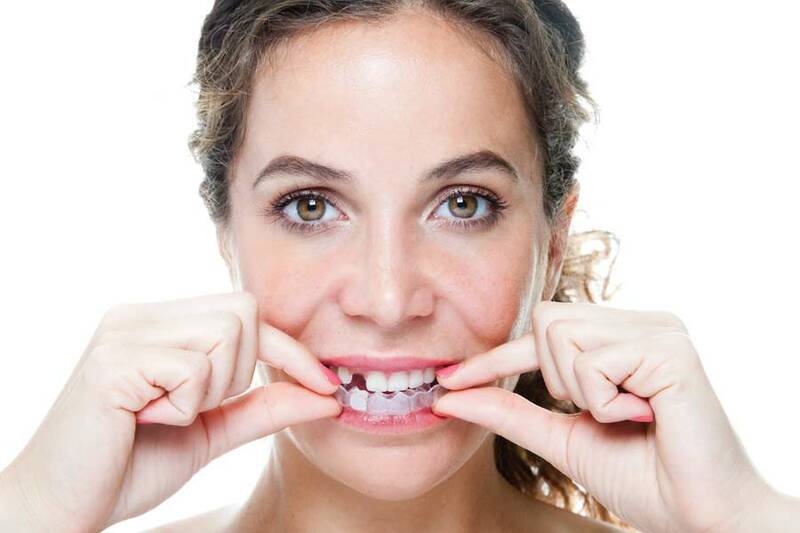 Also the tooth movement can be slowed down to minimize force and protect any loose teeth. Teeth that have been loosened by periodontal disease can also be splinted (attached to healthier teeth) for support during clear aligner treatment. Several clinical trials have shown improved periodontal health during orthodontic treatment with clear aligners while fixed braces have almost always been associated with increased inflammation and mild periodontal breakdown — despite preventive measures performed during treatment. There have been no reports of decalcification and only one reported case of root resorption (breakdown of tooth-root structure) with clear aligners, whereas with fixed appliances, numerous incidents of both decalcification and root resorption have been reported. They are nearly invisible, so it will not be obvious to anyone that you are undergoing orthodontic treatment. Teeth can be whitened while the aligners are being worn, if that is part of your smile makeover plan. A gap or space from a missing tooth can be disguised during orthodontic treatment with a temporary tooth made of composite material placed in the aligner. Yet clear aligners can also have some limitations. For one thing, this type of treatment requires a greater level of patient responsibility than wearing fixed braces. Think about it: if you don’t wear the aligners for a minimum of 20 hours a day, the treatment will be ineffective. If you feel you would be tempted not to wear them, clear aligners may not be right for you. This person was born without the two permanent teeth that normally come in on either side of the two front incisor teeth. Over time, the adjacent teeth have shifted around to partially fill those spaces. Clear aligner therapy will create enough room to properly replace those two natural teeth. The aligner has two prosthetic teeth built in to disguise the gaps during this treatment phase. Instead of having several small gaps, she now has two large spaces that are the perfect size to accommodate her dental implants. With new implant teeth in place, along with new porcelain crowns and veneers on her natural teeth, this woman now has the beautiful smile she’s always wanted. Also, there are certain types of tooth movements for which aligners are not suitable. In general, fixed appliances are necessary for very complex forms of tooth movement like moving tooth root ends through significant distances in bone, whereas clear aligners are more suitable for tipping movements of teeth. Another example is tooth impaction, where a tooth has failed to grow in normally and is covered by gum tissue and bone, and will need a specialized fixed appliance to guide it into proper alignment after exposing it surgically. Your dentist or orthodontist will explain whether clear aligners can be used in your situation, or whether you would benefit more from traditional braces. Sometimes a combination of the two is necessary. Once your teeth are in a favorable alignment and any gum disease has been brought under control, it becomes possible to proceed with tooth-replacement, whether by dental implants, bridgework, or partial dentures. You will still need to wear retainers (as any orthodontic patient does) to make sure your teeth don’t drift back to the positions they were in before you started orthodontics, and to allow the teeth to stabilize in their new positions. Depending on the type of malocclusion you have (“mal” – bad; “occlusion” – bite), orthodontic treatment to replace missing teeth can take a few months up to a couple of years to complete. The new, improved smile that results from it, however, can last the rest of your life. It’s important to remember that you’re never too old to have the smile you want — and with all the techniques dentists have at their disposal these days, there’s no reason you shouldn’t be able to get it.